MEREDITH GODREAU SINGS and her clear vocals fill the room with beautiful sounds. Compelling and affecting, her voice has the most beautiful timbre that resonates gently and lingers in the air. The captivating vocal talents of native New Yorker Meredith heads the project Gregory & The Hawk  Meredith has been performing under that name to massive D-I-Y success for five years. During that time, she's sold over 15,000 self-released singles and brought a groundswell of support on the internet that has resulted in over seventeen pages of fans covering her songs on YouTube. Not only is this a staggering accomplishment for an artiste without a label, manager or booking agent, but she also receives around sixty fan letters a week  half of them from the UK. One evening, at Brooklyn's Southpaw, Meredith was performing to a mesmerised audience  including FatCat, who had come across her quite by chance. A month later she was in the studio, working on what would become Moenie And Kitchi, her first album for the label. Meredith's voice is superb. It is sweet and clear as she reaches out to each note with the most subtle of touches. She is a delight to listen to  Gregory & The Hawk's album Moenie And Kitchi is a magnificent blend of New Age/Folk/Pop that cannot fail to please. Meredith conceived the name Gregory & The Hawk in 2003, initially to prevent her from being perceived of or pigeonholed as a female singer-songwriter (although, we are told, perhaps ironically, when pressed for a list of influences she cites Nick Drake, Liz Phair and PJ Harvey). After playing alone for a few years, she met Mike McGuire in New York in 2005 and the two played live shows together for several months before teaming up with bassist Jeff Ratner and drummer Adam Christgau (both of New York band Paper And Sand). The four of them recorded a self-released EP, Boats And Birds, in 2006. Not long afterwards, the four friends moved apart. Meredith began playing live on acoustic guitar and vocals with just Jeff on upright bass. She was playing shows to support the self-released debut album In Your Dreams in 2007, which she made in conjunction with Mike McGuire and Susan Ambrose. Recording Moenie And Kitchi was rather different. While Mike, Susan and various others contributed to it, many of the instruments were played by the album's producer, Adam Pierce (Mice Parade) with the majority of vocals and guitars recorded simultaneously in one take. The result, says the publicity machine, was an album that is both gentle and quietly fierce, often in the same song, from the rolling, shuffling drums at the opening of the beautifully melodic and poignant Oats We Sow; through the dramatic ebbs and surges of Wild West and the propulsive brass/electric guitars that mark the remarkable, very moving Ghost  the whole affair held together by Godreau's silken, expressive tones. Idiosyncratic and hook-filled, the album heralds the arrival of a genuine and irresistible talent. Gregory & The Hawk's Moenie And Kitchi is a wonderful collection of songs and the single release from the album, Ghost, is much more than just a very moving pop song with its alluring beat that changes as Meredith sings a cappella before the music rushes back as if to draw a line under the track. August Moon is a very evocative track with a fantastic opening that lives up to its promise, with terrific guitar work enhancing the challenging vocals as Meredith rises to the occasion. Super Legend is another creditable track in the same vein and feel of the album. 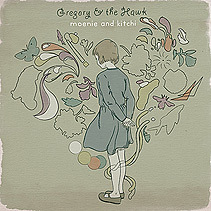  Gregory & The Hawk's album Moenie And Kitchi is due to be released on 13 October (2008). The single from the album, Ghost, is due to be released on 29 September (2008). Check out myspace.com/gregoryandthehawk and fat-cat.co.uk.